Comfortable beds, nice views, breakfasts served, elegant furniture and soft carpets are overrated! Most hotels around the world look alike and are just plain boring. Luckily there are also less common places to spend a night. Culture.pl presents a list of some rather unusual hotels in Poland! The memorable Author’s Room is a design lover’s paradise. The boutique hotel is located in a historic tenement building in the Warsaw city centre and consists of four refined and original rooms. Each one of them was designed by renowned designers, artists and architects and is seemingly an encyclopaedia of contemporary Polish design. There are no random elements in this hotel: absolutely everything was created by Polish designers and specially selected – from the furniture and fixtures all the way to the bathrobes, cosmetics and cutlery. Author’s Room was established by Magda Ponagajbo, Michał Pawlik and Piotrek Ręczajski from the Polish design studio Mamastudio. To create it, they worked with numerous Polish designers, artists and experts in their respective fields. 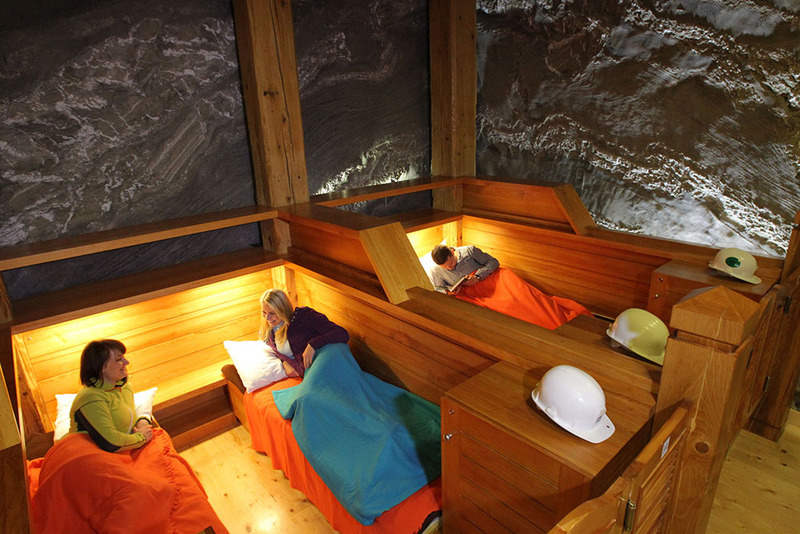 Two most commonly known Polish salt mines, both UNESCO World Heritage Sites, offer their guests a night underground. In Wieliczka, you can spend a night in Komora Słowackiego (editor’s translation: Słowacki’s Chamber). In Bochnia, the chambers for guests are as deep as 250 meters underground! Although the temperature in the chambers is low (around 14-16°C), spending a night there in not just an adventure: salt chambers have their own microclimate, which is good for the respiratory system, soothes the symptoms of allergies and boosts one’s immunity. Although not many people would associate Tychy with antiquity it is there that you can find… a pyramid. The five-star-hotel designed by Krzysztof Barysz and Aleksander Nowacki was built in 2004 not far from the recreational area near the Paprocany Lake. This distinctive building was built on a hill which is believed to have healing powers. Supposedly, under the ‘pyramid’ a chakra can be found – a place with exceptionally good energy springing from it. Those who don’t believe in the energising power of the Earth can just visit the spa or eat a nice meal in the Kleopatra Restaurant, the Nefretete Lobby Bar or the Ramzes Drink Bar. 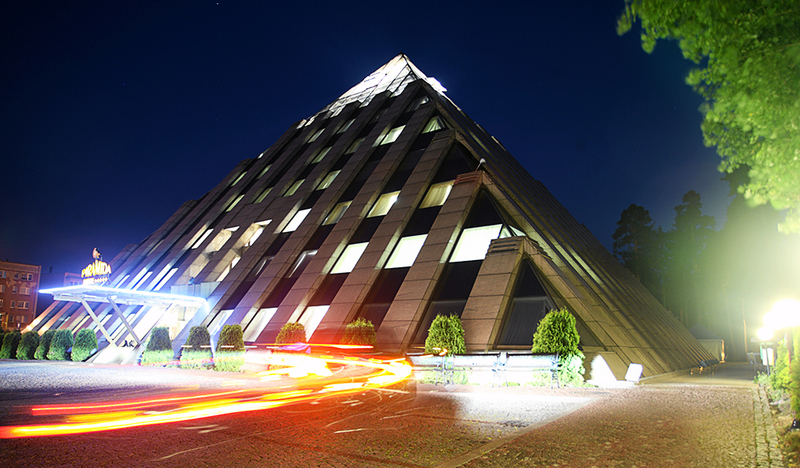 The building in Tychy is inspired by the Great Pyramid of Giza – the scale is 1:5. This is an option for those who don’t need a lot of space and like new experiences. 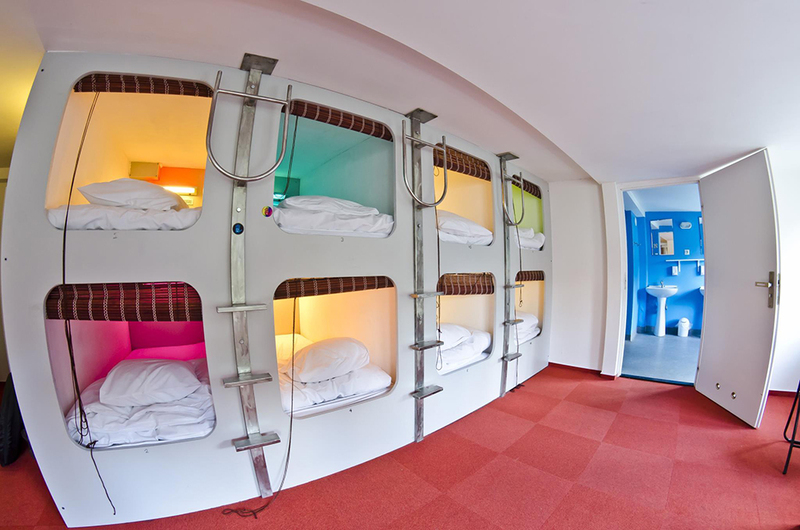 Similar hotels are common in Japan, but in Poland, a hostel that offers a night in a one-person sleeping capsules is certainly exotic. 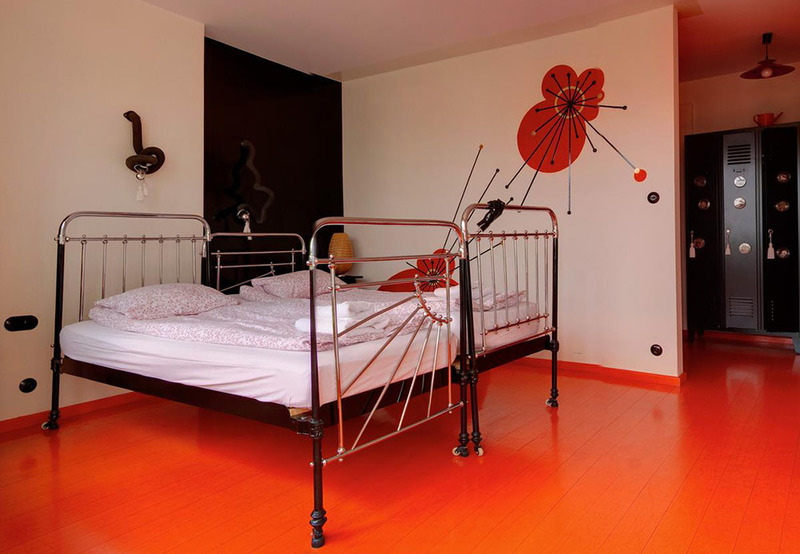 You can find this unusual hotel in the quiet Żoliborz district in Warsaw. The oblong capsules aren’t big but very comfortable and certainly less common than a traditional old hotel room. It’s advisable to spend more than one night in this hotel and preferably each of them in a different room. The Lalala Arthotel is a madly artistic place: each room and each bathroom is a small piece of art created by a different artist. Some rooms have a dark vibe; there are minimalistic interiors and those that are bursting with colour. The walls are covered with frescoes and engravings; some beds are surrounded by artificial animals. Each element is different – folksy, sacral, exotic. The tones vary from restrained elegance to crazy kitsch. A night in a castle is not only a chance to fulfil a childhood dream of being a princess or a knight. It’s also a special opportunity to truly get the feel of ‘ye olden times’. Accommodation in castle hotels varies – you can live in a king’s chamber or a dungeon, you can find a room with a marvellous Baroque décor but also a modern space with 21st-century facilities. 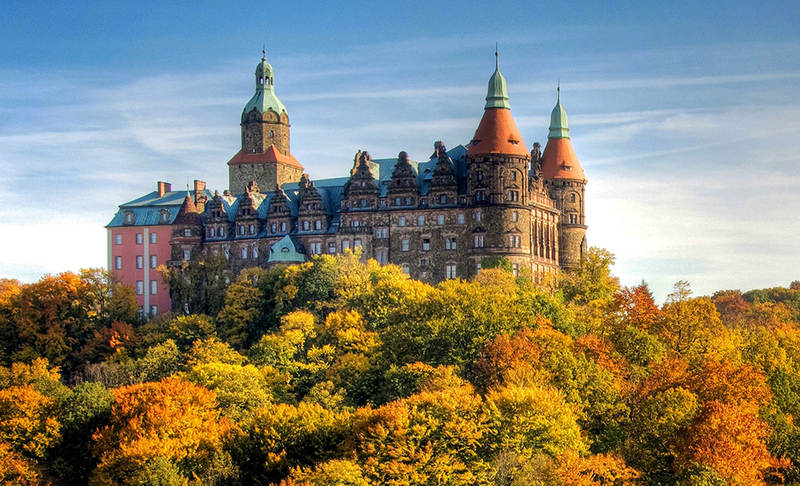 These days even a castle from the Middle Ages can have a modern conference room, a swimming pool or a spa. In the 19th century a German industrialist built a big textile factory in Pabianice; after World War II it was the location of the Pawelana Wool Textile Factory. The factory was also used as a set in Andrzej Wajda’s The Promised Land. After 1989, it was closed, as were many similar industrial facilities in the Łódź Voivodeship. In 2007, the new owner of the deteriorating factory buildings announced a competition for their revitalisation and expansion. During the next years, a hotel, offices, shops and other businesses appeared in the old factory buildings. 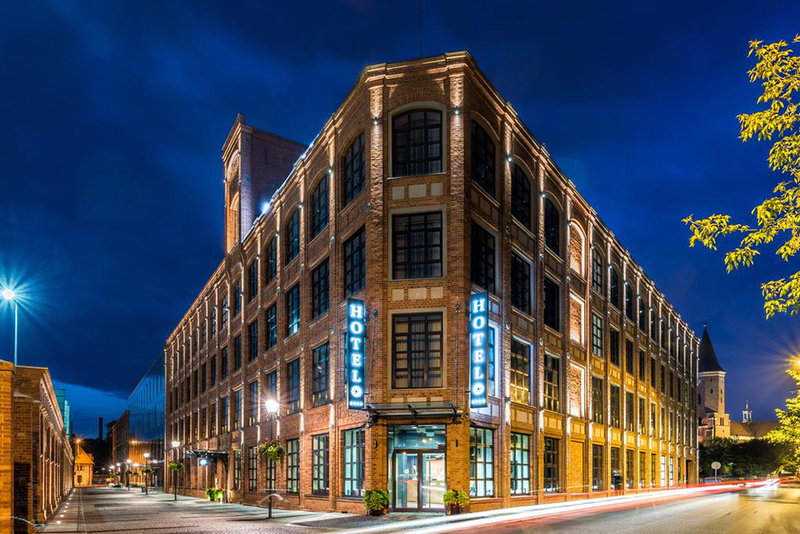 The hotel offers four-star quality and not only a space with a special post-industrial atmosphere but also a conference centre and an entertainment centre (including, among others, a bowling alley). ‘Real relaxation starts a couple of metres above ground,’ say the creators of a cosy hotel in a well-known health resort in the Lubelszczyzna region. It doesn’t resemble any traditional accommodation facilities – it consists of small houses located above ground and hidden among the trees. The hotel is perfect for those who loved climbing trees in their childhood or those who always dreamed of having a real treehouse, but mostly for those who can truly relax only when surrounded by nature. 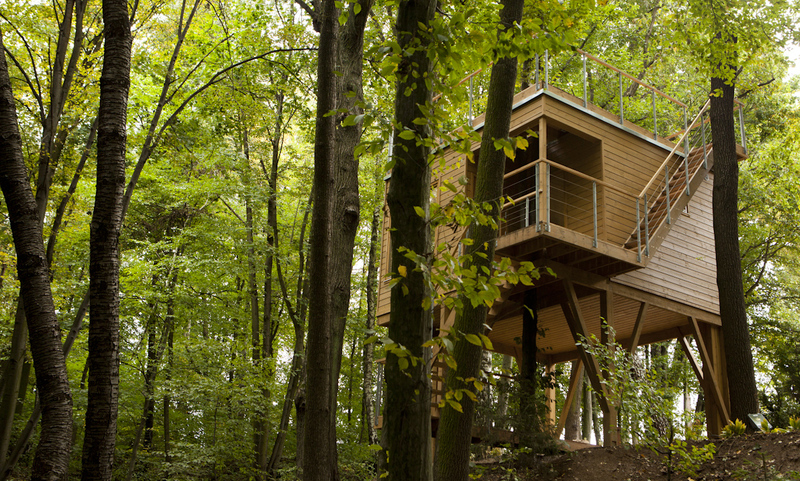 After all, what is a better place to forget about reality than a quiet wooden treehouse amongst the leaves? By the Jamno Lake in Mielno, there is a hotel for those who love being on the water. 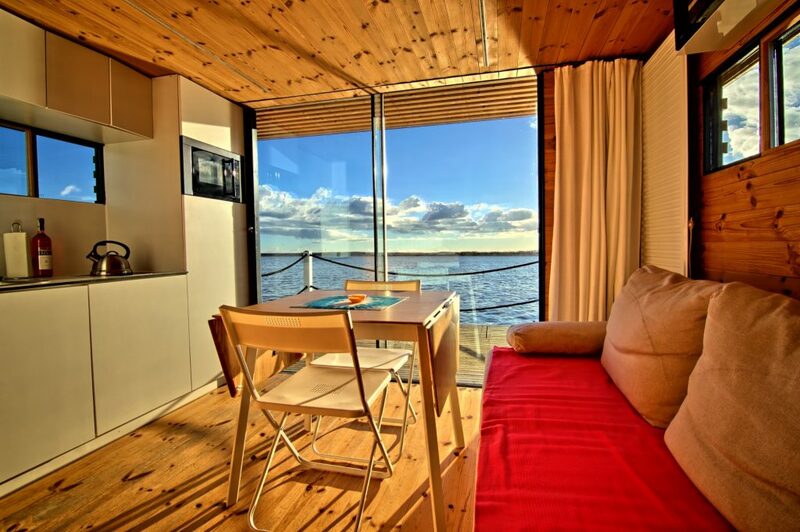 The facility consists of small wooden houses located on piers. Each house has its own terrace and a panoramic window with a view of the lake. The best part is that they are available year-round. And the lake in the wintertime is a sight to see! Some of the houses even have a fireplace and a sauna, which means there’s really no need to leave them the entire time you’re there. In 1902 Tsar Nikolas II commissioned a train station to be built in Białowieża. The Białowieża Towarowa Station hasn’t been active for years – it’s been replaced by a restaurant and a hotel which managed to preserve the atmosphere of the days of the Tsar. The carefully renovated, richly decorated wooden building is furnished with furniture from the period. 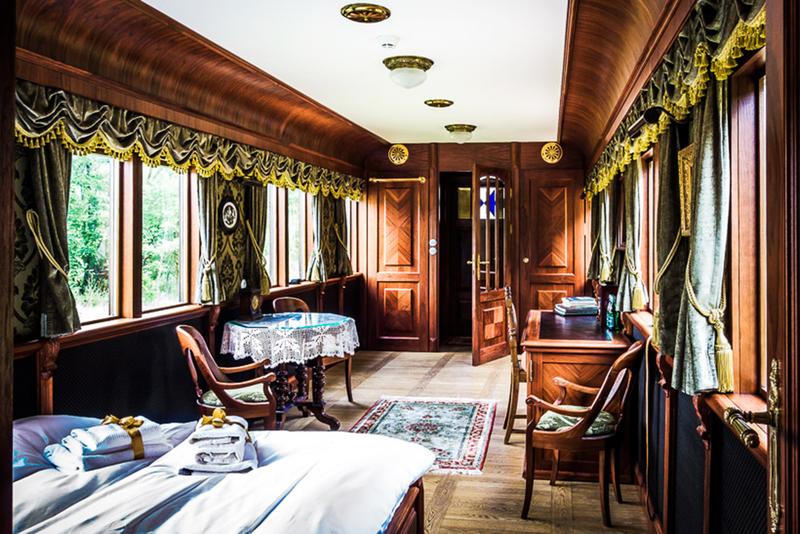 Parts of the station which were adapted for guests include a historic water tower, a lineman’s booth and luxurious cars standing on a spur line, where you can spend a night in a stylish saloon-carriage.